After taking many years off to have kids and start this blog, I went back to teaching in 2014. I couldn’t have made a better choice because I have the best time being back in the classroom. I always leave in a better mood than I came in and with a heart full of all the amazing things I students taught me that day. 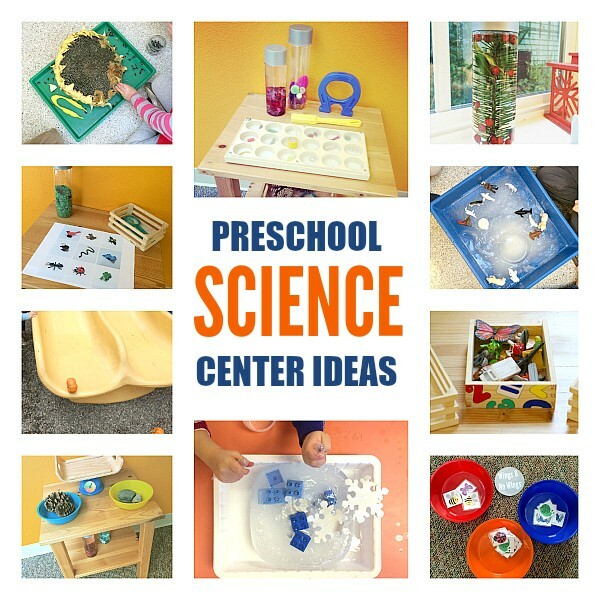 One of my favorite things to explore with my students is preschool science. But the one thing that was missing from my classroom last year was a science area; we still explored science activities, but I wanted a dedicated area for science at free choice. So I grabbed an old night table and started going about making and collecting things for our preschool science center. Here are the materials and activities that have been the biggest hits with my students so far this year. I have more ideas and some new supplies coming that I can’t wait to share soon. 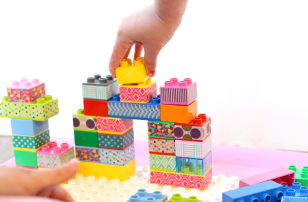 Until then, check out these science activities for 3-year-olds! 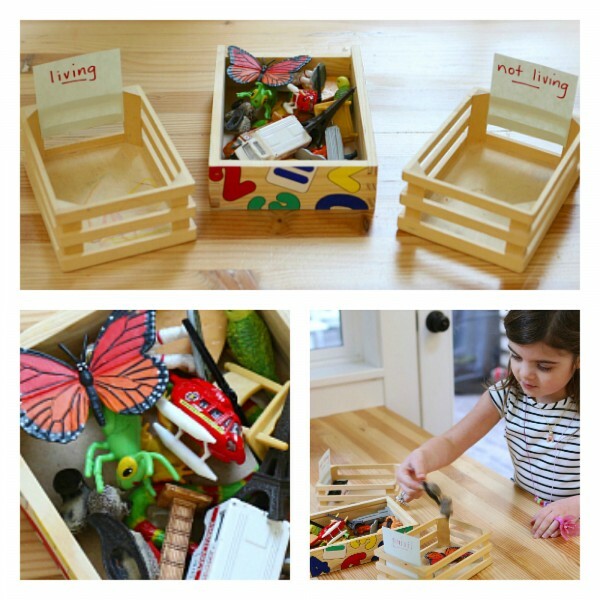 *Some of these activities we moved to the floor, or our table because our science table is small but they would work great in most preschool science centers. 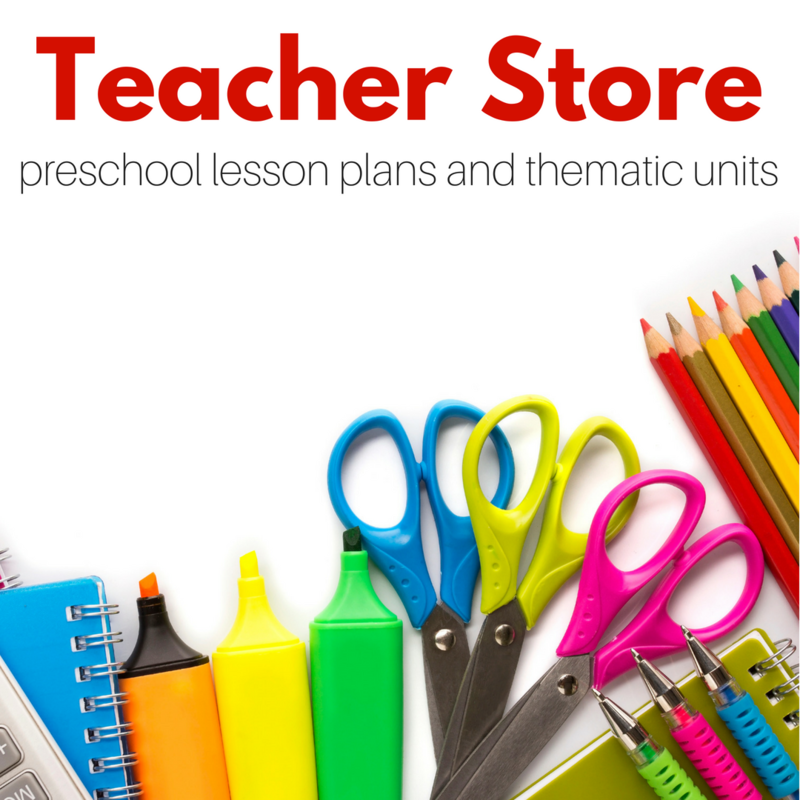 Some of the supplies have affiliate links so you can find the supplies easily on Amazon. Sorting living and non-living things. 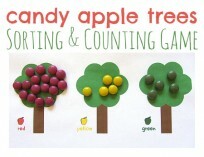 This activity was a hit with my daughter, and I do a similar activity with my students. 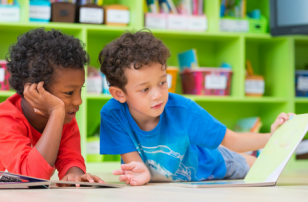 Usually, when I introduce this idea I do it first as a circle time, so every child understands how to do it, so that during free choice they can explore it independently having already been engaged in the activity in a group. 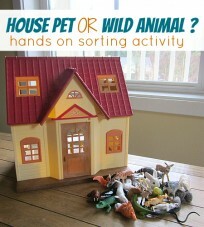 I just found a great book called What’s Alive that I plan to use with this activity in my class very soon. 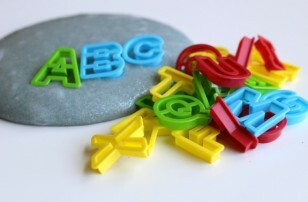 Magnets are so much fun but in a class as young as mine with 2-3-year-olds you need to be cautious. 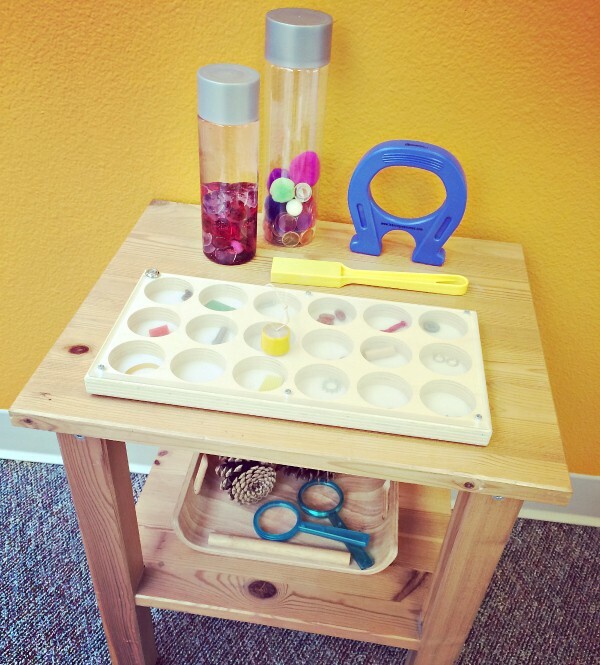 On this table, there is a store bought magnetic exploration tray and two homemade magnetic discovery bottles. Discovery Bottle #1 – Water, heart beads, red glitter, red magnetic balls. The children used the yellow magnet wand to move the magnetic balls around in the water. Discovery Bottle #2 – Pom Poms, magnetic disks, and magnetic balls. Like the discovery bottle above they are both in plastic VOSS water bottles with the cap glued on. The children used the large blue magnet to manipulate the magnetic disks and balls inside the bottle. I planted this sunflower so that I could do this in my class. There is no huge agenda other than exploring. We used the tweezers to get seeds out, although the children figured out by “scratching” the seeds they would fly out at them. While they did that, I opened many of the seeds to let them taste the seeds as well. I love bringing nature inside, even though we go outside for a good chunk of time daily I can never get enough of interacting with nature. This science activity was a huge hit, the kids loved the scale. I like using nature because it gives me one more chance to bring the natural world inside. They didn’t just weight the nature; they explored it too. This play scale was OK, but I just bought this balance one, which will be a lot more accurate and developmentally appropriate as my students gain the understanding of lighter and heavier. The activity is simple; the students weigh the nature to see which is heavier. They also then added all the items on, tried to see if two rocks were equal to 2 pinecones and one rock… the exploration was in depth. I hope they enjoy it when we do it again with the new scale filled with flowers and soil later this month. Exploring Habitats, Predators, and Prey. 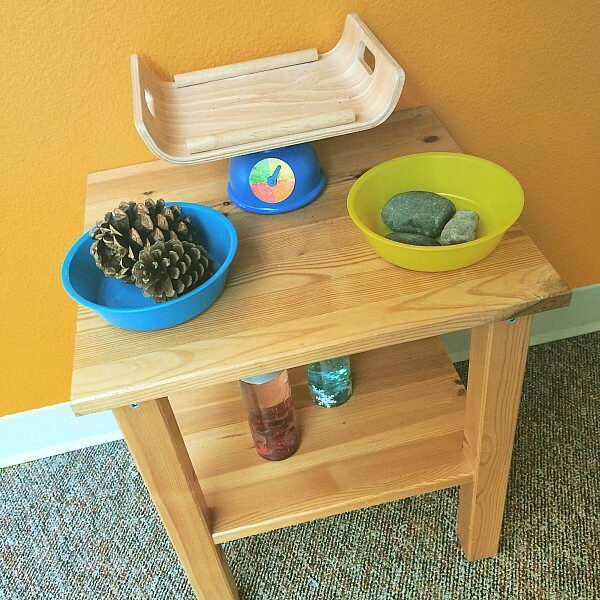 Bringing the outside world into a small classroom for very young children isn’t always easy. One of the more successful attempts at exploring, the larger world inside our class has been this Arctic Ice sensory bin. To see how I made it check this post out. How we played was just like we play with any sensory bin I will join in from time to time and listen to how they are playing. One of my students was very interested in what the polar bears ate. So we all learned about predators that day. There will always be wonderful chances to teach if you give your students the time to explore. You can find the Artic Animal Figures here. 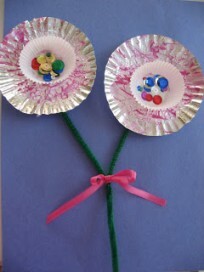 This was so easy to make and the way the children use this is wonderful. These are all animals you see or hear in our area, so the children are familiar with many of them, even at a young age. I did this early in the year and brought it back out multiple times. Recently the children have been using it in pairs and small groups with one child calling out the animal and another finding it in the discovery bottle. 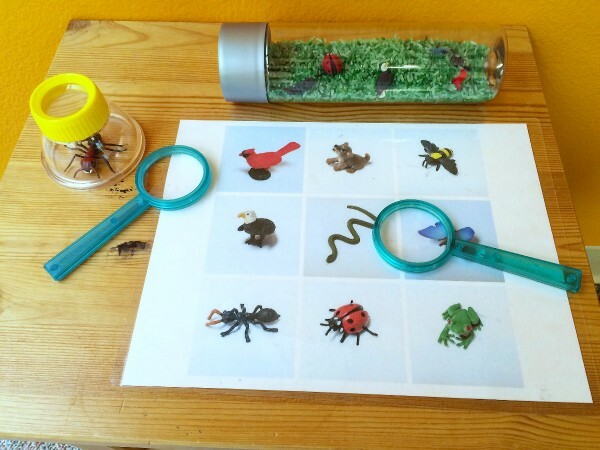 The big bug viewer goes along perfectly with the main activity to give children a choice in the center. Inside the bottle, there is green rice, and Good Luck Mini’s Garden Fun Pack and Wild American Fun Pack animals. I took photos of all the animals with my phone, made a collage and printed it. Add the magnifying glasses and you are set! We just explored this activity this past week, and if you follow me on Instagram, you might recognize this photo. 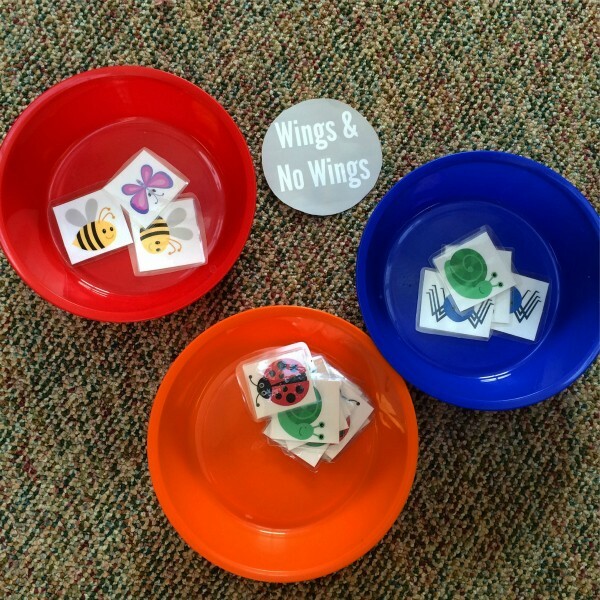 Like the other sorting activity, this one was done first as a circle time whole group lesson and then put out for free choice the following class. The children debated about the ladybug because many have never seen one fly. Great thinking! This activity also led to counting each pile, sorting into small groups of the same bugs, and more. You can read the full circle time lesson plan and print the wings or no wings FREE printable out here. This was thrown together with a clipping from my Christmas tree, and some holly berries from a bouquet and my students loved it. It allowed them to play with the prickly needles and berries without me worrying and hovering about them getting poked ( those needles were so sharp, my arms were shredded after putting the lights on!) or possibly eating the berries. It was fun to turn this bottle upside down and watch the berries try to get around the pine needles to float. Also, the water magnified it all to inspect it that much easier. 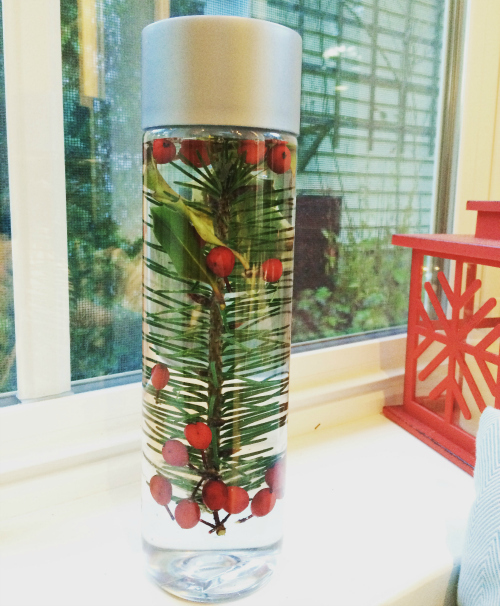 Inside the bottle, it’s just the branch, berries, and plain water. The bottle remained clear and the plants bright for about two weeks; then it started to brown. We made similar ones with leaves for the fall which also stayed nice for about 2-3 weeks. 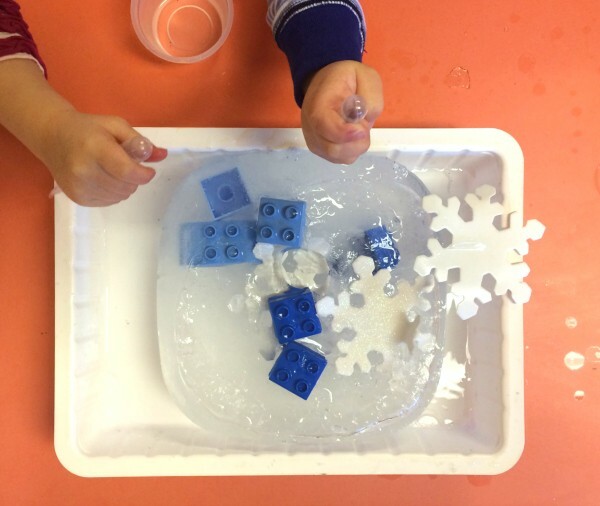 This is such fun and what I would call classic activity for preschool, using pipettes with warm water the children free the toys from the ice. 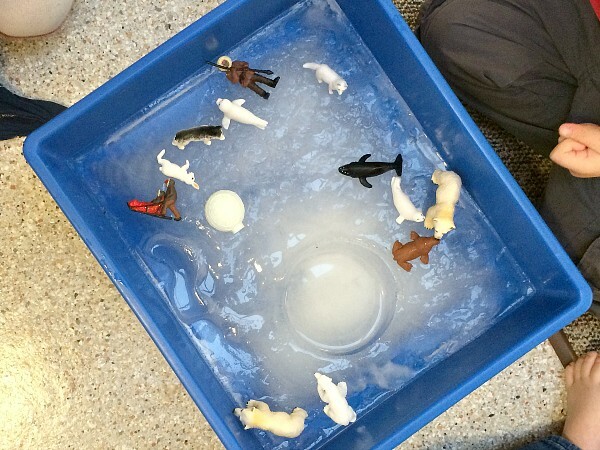 They learn that the ice will melt from the warm water and as it melts the toys come loose. I like doing this as a group because some kids just want to squirt the water and others will stay until everything is free. At free choice children have the chance to do that, engaged at their interest level! 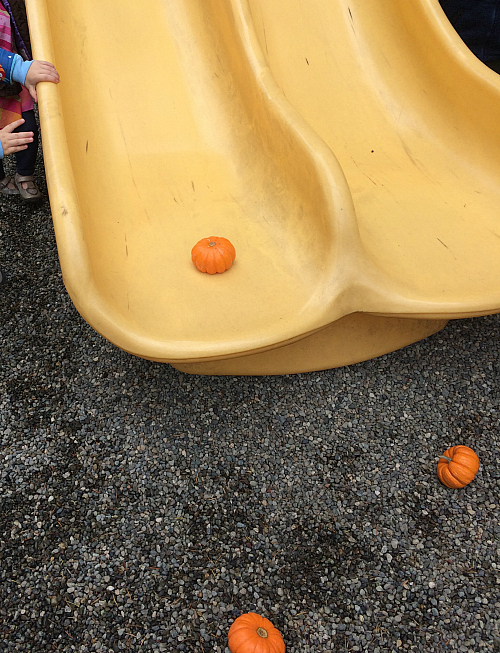 We did a pumpkin hunt on outside in our playground in the fall. 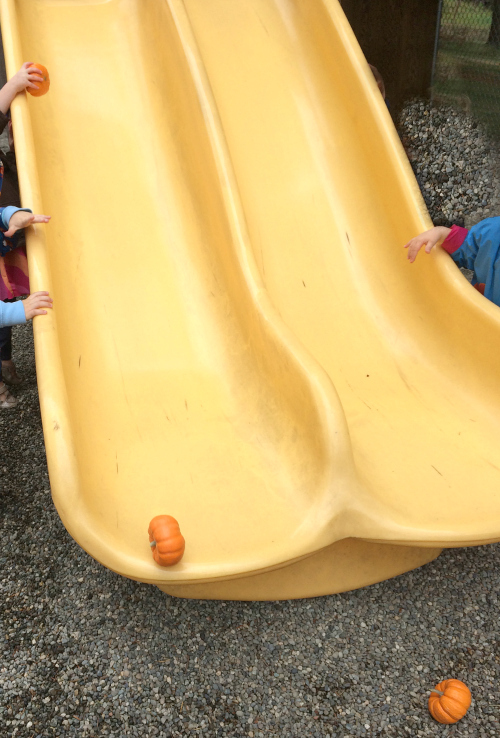 After the children had found one mini-pumpkin each some put them aside and played on our playground, but a few others started seeing if the pumpkins could roll down the slide. Oh heavens! I was so excited watching them explore, have races, and as the next photo shows they also tried to explain why the pumpkins that rolled off their sides didn’t move anymore. Science and play together! 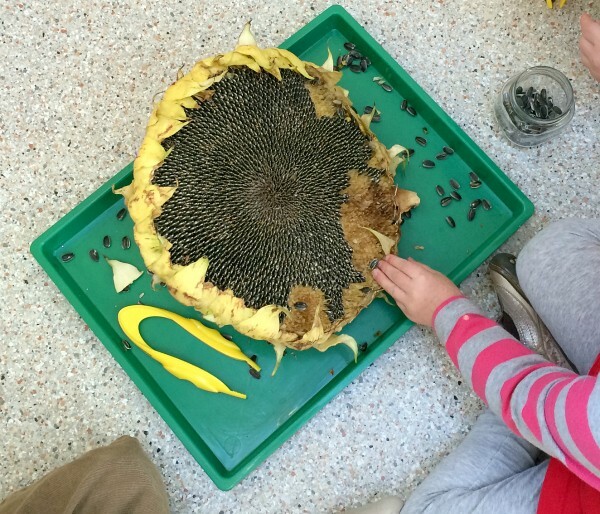 How do you fit science into your free choice time at preschool? Tell me about it over on my Facebook Page! Previous Post: Get Curious with Curious George! What great ideas! I’m going to make the creature-finding one this week, for sure. I can feel worms coming on in my Kinder room any day now with all the soil-digging we’re doing, and I’m sure the Wings and No Wings will go over well then. Oh awesome – I need a book about balance. Thank you so much for that tip! We bought a bunch of the Safari Animals when they were on sale too! thanks can’t wait to try these science ideas. we have been playing with the magnets todayas know baby, will make up the bottles so will be safe all the time. These ideas are fantastic! I was just needing some things to do with my 3 year old at home as he loves learning and science type activities. We will be doing many of the activities you posted about here. Thank you for taking the time to do this post. I’ve followed your blog for several years now and my kids have enjoyed quite a number of the ideas you have shared. Thank you so much, Lisa! I got the Voss bottles at my grocery store, World Market has them and they are linked to Amazon in that post with an affiliate link if you can’t find them at a store. P.S. Where did you get the bottles you used for the discovery bottles? Thanks! The water bottles are Voss Water bottles. You can buy them in specialty stores which sell the fancy water. I have a lot of these for my science table as well as sensory areas. They make awesome I Spy bottles. Love all your ideas!! I have a young 4/late 3 class this year. I’ve done most of your ideas, but especially loved the “toys in ice”. I went a step further…..sprinkled rock salt on the top of the ice chunk (filled with farm animals) and they watched the scientific process happen!! Rock salt & water melts ice!